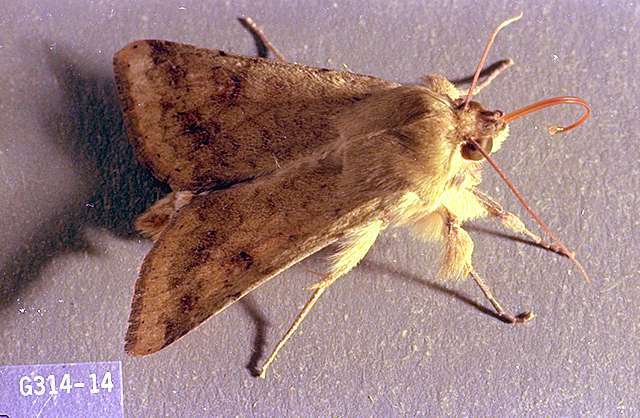 Pest description and crop damage Large green, brown, or yellow worms that feed within silk and ears. 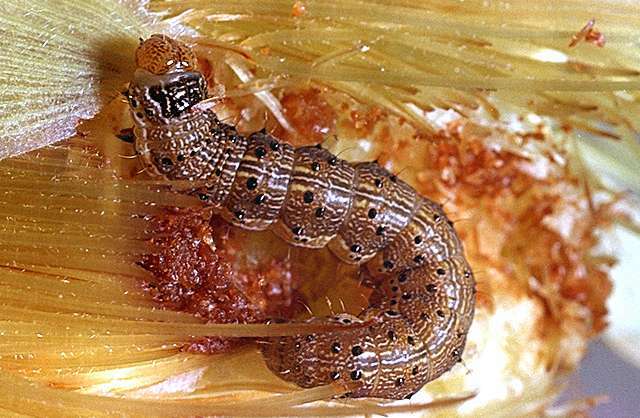 First-generation larvae may feed as "bud worms," damaging leaf whorls and newly forming ears. alpha-cypermethrin (Fastac EC) at 0.011 to 0.025 lb ai/a. REI 12 hr. PHI 30 days grain and stover; 60 days forage. Retreatment interval 3 days. Do not exceed 0.075 lb ai/a per season. beta cyfluthrin (Baythroid XL) at 0.013 to 0.022 lb ai/a. PHI 0 days for green forage and 21 days for grain or fodder. REI 12 hr. Do not exceed four applications or 0.088 lb ai/a per season. bifenthrin (Brigade 2EC, Sniper) at 0.033 to 0.1 lb ai/a. PHI 30 days for harvest, grazing, or cutting for feed. REI 12 hr. Do not apply more than 0.3 lb ai/a per season. bifenthrin/zeta-cypermethrin (Hero) at 0.04 to 0.1 lb ai/a. PHI 30 days grain and stover; 60 days forage. REI 12 hr. Do not graze for 30 days after treatment. Do not exceed 0.4 lb ai/a per season. Burkholderia spp. (Venerate XC) at 1 to 8 qt/a. PHI 0 days. REI 4 hr. OMRI-listed for organic use. carbaryl (Sevin 4F) at 1 to 2 lb ai/a. PHI 14 days for forage or silage grazing, and 48 days for grain harvest. REI 24 hr. Do not exceed four applications or 8 lb ai/a per season. Latex-based formulations, such as Sevin XLR Plus, are less hazardous to bees. chlorantraniliprole/lambda-cyhalothrin (Besiege) at 0.049 to 0.098 lb ai/a. PHI 21 days. REI 24 hr. Do not exceed 0.12 lb ai of lambda-cyhalothrin or 0.2 lb ai of chlorantraniliprole per acre per growing season. Retreatment interval 7 days. chlorantraniliprole (Coragen) at 0.045 to 0.098 lb ai/a. PHI 14 days. REI 4 hr. Do not exceed 4 treatments nor 0.2 lb ai/a per season. Retreatment interval 7 days. chlorpyrifos (Lorsban Advanced) at 0.7 to 0.94 lb ai/a. PHI 21 days before harvest of grain or ears. REI 24 hr. Apply as a broadcast spray. Do not exceed 3 lb ai/a per season for all chlorpyrifos treatments. cyfluthrin (Tombstone) at 0.025 to 0.044 lb ai/a. PHI 0 days for green forage and 21 days for grain or fodder. REI 12 hr. Retreatment interval 7 days. Do not exceed four applications or 0.175 lb ai/a per season. deltamethrin (Delta Gold) at 0.018 to 0.022 lb ai/a. PHI 21 days for grain or fodder, or 12 days for forage or grazing. REI 12 hr. Do not apply more than 0.095 lb ai/a per season. Retreatment interval 21 days. Limit 5 treatments per year. esfenvalerate (Asana XL) at 0.03 to 0.05 lb ai/a. PHI 21 days. REI 12 hr. Do not exceed 0.25 lb ai/a per season. flubendiamide (Belt SC) at 0.0625 to 0.094 lb ai/a. PHI green forage and silage 1 day; grain and stover 28 days. REI 12 hr. Retreatment interval 3 days. Do not exceed 0.375 lb ai/a per season or 4 treatments. gamma cyhalothrin (Declare) at 0.0075 to 0.0125 lb ai/a. 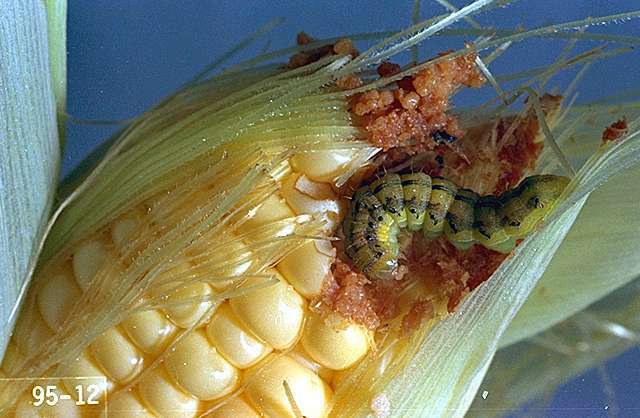 Effective prior to larvae entering the ear only. PHI 1 day for grazing and forage, or 21 days for fodder and silage. REI 24 hr. Do not exceed 0.06 lb ai/a per season. HZNPV (Gemstar LC)-Insecticidal virus product. OMRI-listed for organic use. lambda-cyhalothrin (Warrior II) at 0.015 to 0.025 lb ai/a. PHI 21 days. REI 24 hr. Do not apply more than 0.12 lb ai/a per season, 0.06 lb ai/a after silk initiation, or 0.03 lb ai/a after milk stage. methomyl (Lannate SP) at 0.22 to 0.45 lb ai/a. PHI 21 days for ears, 3 days for forage, 21 days for fodder. Do not exceed 2.25 lb ai/a or 5 treatments per season. REI 48 hr. Retreatment interval 5 to 7 days. methoxyfenozide/spinetoram (Intrepid Edge) at 0.188 to 0.281 lb ai/a. PHI 28 days. REI 4 hr. Do not exceed 0.625 lb ai methoxyfenozide and 0.125 lb ai spinetoram per acre per year. Limit 3 treatments. Retreatment interval 4 days except 2 days for silking. permethrin (Ambush 25W) at 0.1 to 0.2 lb ai/a. PHI 0 days for forage; 30 days for grain harvest or fodder. REI 12 hr. Allow 6 days between treatments. Do not apply more than 0.6 lb ai/a per season. spinetoram (Radiant SC) at 0.023 to 0.047 lb ai/a. PHI 3 days forage or fodder; 28 days grain. REI 4 hr. Do not exceed 0.125 lb ai/a per year. Do not exceed 3 treatments. Retreatment interval 4 days. spinosad (Success) at 0.047 to 0.094 lb ai/a. PHI 28 days grain or fodder; 7 days forage. REI 4 hr. Do not exceed 0.188 lb ai/a per season. OMRI-listed for organic use. tebuconazole/lambda-cyhalothrin (Crossover) at 0.14 to 0.16 lb ai/a. PHI 21 days fodder and silage. REI 24 hr. Retreatment interval 7 days. Do not exceed 0.48 lb ai/a tebuconazole or 0.12 lb ai/a lambda-cyhalothrin per season. zeta-cypermethrin (Mustang) at 0.022 to 0.05 lb ai/a. PHI 7 days for grain, stover and forage. Do not exceed 0.2 lb ai/a per season. REI 12 hr. Retreatment interval 3 days.